We are very proud and honoured to present you the following interview with lawyer and Ismaili Muslim Zafir Dewshi on Islam, the dehumanization of faith, the need for openness and more. We need more ambassadors who openly speak with each other and are not afraid to ask and answer questions, always putting the principles of tolerance and respect first while being frank and honest about their feelings and thoughts. Zafir strikes us as exactly this kind of a person! Thank you, Zafir, for openly answering our questions! Part II of this interview will follow next week. Santa: Could you please tell the reader a few words about yourself and your background? I am a German national with Indian roots, living in… I always find it hard to position myself when someone asks me. I know you and me have Indian roots in common and passion for good food and coffee. How else would you define/ introduce yourself, if I may ask you? Zafir: In addition to being somewhat of a coffee aficionado, I am a music loving Londoner who avidly supports Tottenham Hostpur FC, for better or for worse. In terms of my cultural background, I am a British East African Asian who was born in London, England into an Ismaili Muslim family, with my parents being from Tanzania and having Indian heritage. My Father completed his schooling in England where he arrived in 1960, and my Mother in 1970. There was considerable migration of East African Asians from Tanzania during this period due to a hostile political and socio-economic environment. Today, my extended family is predominantly settled around England and Canada. As you know, my academic background is in law, and I should stress that while faith is of significant importance in my life, I claim no particular expertise in religion or politics. Like you- I believe that there has been much shared misunderstanding between people, which has led to polarization and waves of intolerance. I concur that we must have more open discussion and attempt to prevent the dehumanization of a faith whose 1.6 billion adherents, contrary to being a monolithic block, are inhomogeneous and greatly diverse in interpretation, tradition, language and culture. Santa: This is exactly how I feel when I hear the various discussions about Islam – that we are dehumanizing a faith and with that generalising every Muslim, including the majority of peaceful believers. Now a practical question: How is life for you as a Muslim from an Ismaili community in the UK? I personally feel we people talk too little and mostly only within our community box. Religion and culture are often treated as a taboo. And then I am afraid of people like Trump and also right winged parties in Europe who – in the light of terrorist attacks – are sensing the growing fear of Islam. And manipulate it by acting outspoken while being outright racist and offensive. Is this also your impression? Zafir: My experience of living in the UK all my life has been a largely positive one. As an English Muslim I have seen no issues relating to the free practice of my faith and feel privileged to call England my home. Growing up in Northwest London amongst vast diversity, I believe that I have been fortunate enough to develop a pluralistic outlook. I think that this has been forming since a child, when I was exposed to several different traditions, whether it were through participation at school gatherings, religious education in the classroom, or visiting temples, churches, and other places of worship. My own faith has positively encouraged a rounded worldview, and acceptance of a common humanity regardless of ones religion. I have only experienced isolated acts of racial intolerance, one of which occurred during the time of a well-publicised war in Afghanistan. Perhaps knowing one another on a human level dispelled any fear amongst friends regarding our religious convictions, and meant we seldom discussed them in-depth. I agree with you, that in Britain there can be a taboo around religion, and discussing it with others is not always accepted or appropriate without the correct platform. The paradox is that although we are becoming more globalised, our communities seem to have become too insular. No matter how much we put it aside, religion is still very much a part of the lives of our people and the fabric of our society. And while I sympathise with those whose understanding of faith is a very personal affair, we can clearly see the dangers of not communicating/understanding each other manifesting. Religious hostility and intolerance unfortunately exists worldwide from Myanmar, Nigeria and South Sudan, to Russia and the Philippines between different religious groups and also within them. Santa: And yet since you are a Human with a Muslim background do you feel inhibited or under scrutiny in any way? Do the recent events of Islamic fundamentalist attacks affect your life? Zafir: I do not feel inhibited as such, but understand a need to be cautious of those who may be misinformed against Islam and are seeking some kind of reprisal. It is a real concern that backlashes of verbal and physical abuse have occurred in London, mostly on veiled Muslim women and those who are identified as Muslim through their attire. There have been alarming reports of a 300% rise in Islamophobic incidents in the UK since the Paris attacks, the most acute being an attempted torching of a mosque in North London. It is hard to divorce oneself from the abhorrent events we have seen on a human level. And while we should not forget the victims of other attacks across the world, including Beirut (not as extensively reported), those in Paris were particularly close to home. Like any other European, I have the same emotion and fear about what is happening, in addition to worries of how extremists are falsely paraded as an authority on Islam. I am also concerned about the killing and displacing of many Muslims, Christians and minority groups such as the Yazidis, creating a more fragmented world. Since the attacks in Paris, there has been a wavering of compassion towards these helpless people, and a worrying political discussion regarding the monitoring of refugees‘ religions to check if they are Muslim, due to fears of ‘terrorists’ entering. With Paris being a global city, in addition to a significant number of French nationals, there were also British, Tunisian, Chilean, German victims and so on, from many faiths (including Muslims), who were indiscriminately killed. Vigils were attended and condolences sent on behalf of various Muslim communities in Britain along with prayers for peace. I do not believe there can be grounds for justification of this in any human conscience. It is worth mentioning that at Valeria Solesin’s funeral (an Italian victim), her father arranged for leaders from the Muslim, Christian and Jewish faiths to speak in an act of great solidarity. I believe we can take heed from his example and unite through these difficult times. Santa: What strikes me so wrong is that I still hear people saying that they do not hear any or enough Muslim voices condemning these terrorist acts. In the Social Media but also in some mainstream news channels like CNN I see people asking Muslims to justify and even apologise for acts committed by Daesh, e.g. in this video. I find this behaviour utterly pointless and very very offensive. How does this attitude make you feel – or other Muslims you know? Zafir: What I have seen happen in this clip, and can be quite common, are that abnormal radical and politicised misrepresentations of the faith cannot be distinguished from what the vast majority of Muslims believe. Islam is also being seen once again as a standardised block, which could not be further from the truth. The suggestion that all Muslim communities in Paris were somehow guarding information of terrorists is offensive and quite frankly ignorant. Furthermore, when the media are constantly labelling terror attacks as ‘Islamic’ it is also misleading, and confuses those who are illiterate about Islam. It is just untrue to associate terrorism exclusively with a faith, which talks of compassion, tolerance, and peace; perhaps showing a brighter side of the picture would just not make a good news feature. A consequence of these types of accusations on social media and mainstream news, is that Muslims having absolutely nothing to do with acts of terrorism, are left feeling singled out due to their religion being put on trial. These attackers should be treated as an anomaly of Muslims responsible for hateful criminal acts- like we would if it were terrorists of extreme religious affiliation such as the Klu Klux Klan for example. My argument is that we should be educated enough to separate acts of violence done in the name of Christianity, Islam, Judaism or any other faith from the religion itself. Asking a random person to apologise for acts, which have killed citizens of her or his own nation because they self-identify as Muslim is unacceptable. The media should play a significant role in any society, however, it seems that their own agendas sometimes cause them to act irresponsibly and spread misinformation. This often happens in the US, where I have heard Muslims simply referred to as ‘the enemy’ on a popular news channel- further risking the validation of anti-Western sentiment and radicalisation. Santa: These are sad times. It is incredible that black and white terms such as „the enemy“ are applied. And indeed, we also believe that the media holds a strong moral responsibility of de-escalating as opposed to spreading more hatred and confusion. What advise would you give us so that this tendency of alienation from both sides does not continue? Zafir: Following on from the last question, I would advise that the media, and those in privileged positions such as politicians, should be more responsible, and avoid rhetoric capable of polarising communities. We are all a common humanity and should remain united against any attempts to attack and divide our society by extremists. Furthermore, policies should reflect a commitment to the realities of cultural diversity, rather than treating it as a burden. The vilification of Muslims and fear-mongering has the potential to create division and fuel the radicalisation of vulnerable Muslim youth by demagogues who manipulate hostile political climates and prey upon their frustrations. I would also advise that educational institutions include in their religious studies syllabi, the plurality of Muslim belief, culture, art, and traditions, rather than favouring a primary focus on practices and rituals. If there were a widened understanding of Islam’s diversity and its achievements of inclusive chapters in Islamic history, perhaps there would be less fear and alienation in the West. For example, learning about the Fatimids in Cairo, Abbasids of Baghdad, or about Al-Andalus in Spain, which thrived for hundreds of years under Muslim patronage, and where Jewish and Christian peoples actively participated in a pluralistic society. To Muslims who are faced with misunderstanding of their faith, I would advise that they attempt to explain to those who have uninformed opinions, with dignity and kindness. We should attempt to shine a light on any misgivings, rather than being defensive, and leaving people in a state of ignorance and confusion. It may be that the only thing some people know about Islam is through the media, which primarily portrays conflict and intolerance. There is therefore a duty to try and inform them that Islam is not about war or vengeance, but about generosity, humility, unity and compassion. Beyond ascribing to British, French or even European values, we are diverse nations and should be working towards an inclusive, cosmopolitan ethic, which many faiths share. Listening to each other, even if we may not agree or like each other, and trying to get to a point of heightened understanding should be our shared goal. An example of where they are furthering this approach is in Canada, at the Global Centre for Pluralism. They believe that when appreciated through mutual respect and inclusive citizenship, diversity has the potential to act as an ‘engine of social and economic innovation’. However, if devalued or debased, diversity can worryingly become an ‘axis for exclusion and an excuse for violence’. To be continued… Next week we will ask Zafir more questions about Islam, what draws young people to ISIS and the need for identity. My daily life is so full of discussions about refugees, politics, religion, media, racism, fear, faith, anger, hope, selfishness and humantiy that I often can’t stand it anymore (carnival songs help). Nevertheless, I strongly believe that we can only grow through open-hearted dialouges. HERE is a wonderful place for such a discussion! Thanks to all of you for sharing your thoughts. I am touched. I must say I have never had such an impression of all encompassing conflict before but this time is so strange and scary. Santa, you posted on soldiers guarding the kindergarten of your daughter on FB… I think this is the biggest terror we are facing, this constant threat that is blown up by media and governments. We are constantly reminded, each group of us and need some means to express ourselves. Zafir, you not only made my day – this is the interview I will send around friends, especially those who are now not even hiddenly starting to post content which is getting more and more into a still intellectual and seemingly fact-based but still xenopobic direction. We can talk! I am really happy to read that you still view having lived in the UK as a positive, despite of some Anti-Islam sentiments around! Let’s not get offended at each other – and as you say react with dignity and generosity towards these people who need to talk about their doubts! I am half Arab and what I hear on the streets in London in Muslims communities is not very nice towards Western people either. It is racisms in the other direction, maybe born out of defensiveness…but that’s just not the way to continue. I am also very happy to read the comments of Zahra and Muhammad. 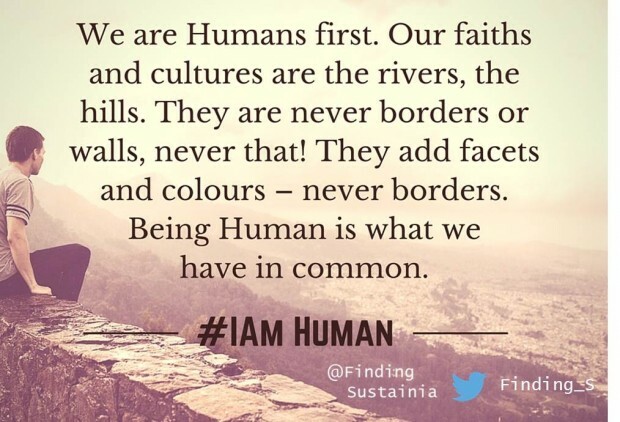 It shows again that we all have being human in common and that we can talk…as long as that we do it nicely. I can only agree with Zafir – and Zahra but also Philipp and Esteban. I am confused, and that made me quite defensive too. Why should I apologise for lunatics who do evil and instrumentalizing Allah? I also see that we Muslims are becoming more insular in the course of misguided discourse. We need to talk, guys. And as a Muslim I am open for discussion and questions, as long as they are not meant offensively. And from my part I want to try to not take offense too quickly, even though it is hard. But if I am honest I don’t know that much about – taken as an example – Hinduism or Buddhists either, so if I asked questions about that I would sound as igorant as some people do when they ask me about Islam. I really think Zafir is right that all world religions should be part of a school syllabus to give people a bit of understanding. Salam Alaikum, World! I am Muslim, quite a faithful one, wearing a veil, praying and I used to have friends from different cultures – and I would like to continue with them. But something has sneaked in since 9/11 and now Paris and since reading Zafir’s interview I can only identify it as mistrust from both sides, something awkward, something one feels one cannot talk about. To be honest I got quite defensive… I probably even got too defensive, posting all kinds of content which I felt as a threat to Islam, refugees being mistreated, discrimination and so on. And I stick to it – there is quite a bit of Islamophobic stuff going on and I hate that wearing a veil makes some people associate me with ISIS… That used to make me angry but reading this interview I have started to feel something else. A responsibility to see the picture a bit more as a whole… yes, there is anti-Muslim sentiments in the air and it makes me angry, defensive, sad and helpless! But I must say as a human I can somewhat understand the confusion of people. 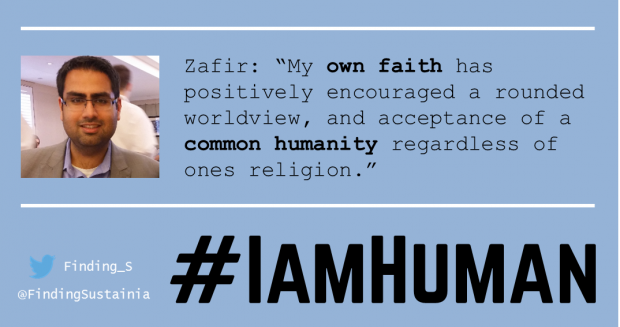 Zafir really puts it right in his advise to us Muslims: “ It may be that the only thing some people know about Islam is through the media, which primarily portrays conflict and intolerance. There is therefore a duty to try and inform them that Islam is not about war or vengeance, but about generosity, humility, unity and compassion.“ And I want to follow his advise to „attempt to explain to those who have uninformed opinions, with dignity and kindness. We should attempt to shine a light on any misgivings, rather than being defensive, and leaving people in a state of ignorance and confusion.“ It is strange that after having read so much, this one first sentence that I quoted seemed like a message coming straight from Allah Himself. Thank you, Zafir, thank you, FindingSustainia and Santa for posting this! May Allah bless you! I like this interview loads! Many of my friends who are – as Philipp above states- are not racist or anything but are confused – and in need of Muslims such as Zafir who shares their view without doing any shaming and blaming. All of us need to stick together and not to radicalise, either in the racist/Islamophobic direction or Muslims turning too radical either. There is a big chance in many cultures and religions living together – Zafir just reassured me in this. Thanks a lot!